In her later years Dorris Wells tried her hand and a number of types of art. A few have been chosen to be presented here. "This is a memory picture of Ambrosia Lane poker games when I was grade school age." 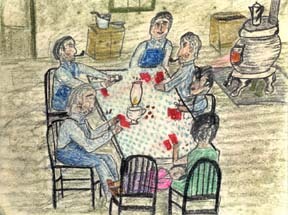 The uncles and cousins played around the kitchen table with Bessie Willows. Dorris drops off to sleep as the hour grows late. 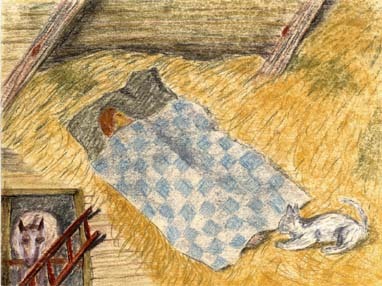 "Sleeping in Uncle Willie's hay loft in barn with cat that pounced on any movement - as toes!" 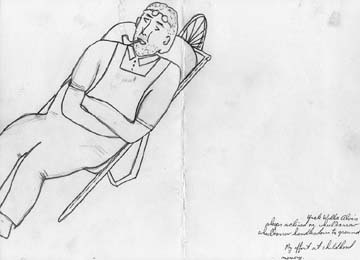 "Uncle Willie Alvis sleeps reclined on wheelbarrow. Wheelbarrow handles down to ground." The above three preliminary drawings done in crayon and pencil, were also committed to oil, with a few variations. One that comes to mind, shows Bessie with a good deal more pennies than anyone else. In another, Uncle Willie is awake, taking a rest in the wheelbarrow after splitting kindling wood behind his house. 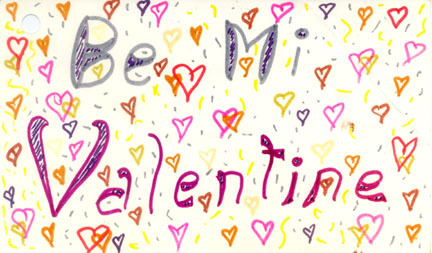 Mom loved to doodle and all the family were recipients of decorated envelopes and cards. There is other artwork which may be added at a future date.